Photo via the Chesterfield Borough Council’s Facebook. There have been many tributes to honor the legacy of Diana, Princess of Wales, on the 20th anniversary of her death. 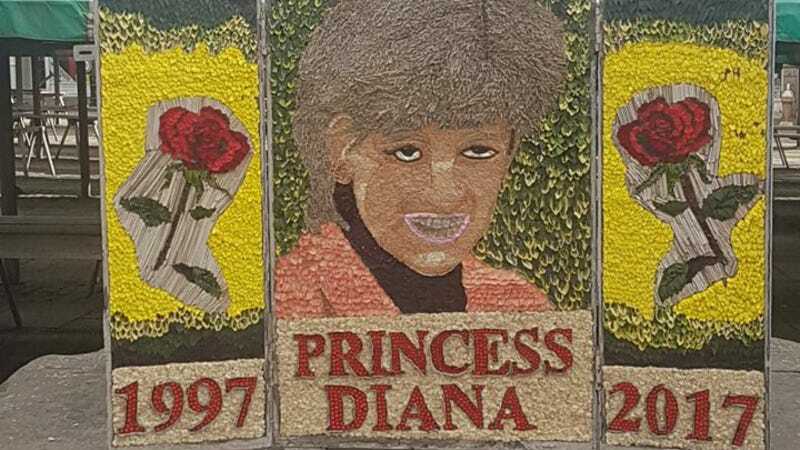 But nothing quite matches this “well dressing” portrait made by volunteers in Chesterfield, England. “The well dressing is produced by 14 volunteers using the ancient Derbyshire art of well dressing, which involves creating designs from flower petals and other natural materials,” a spokesperson for the Chesterfield Borough Council, which posted photos on its Facebook profile, told the BBC. However, as the BBC reports, “the portrait has been mocked on social media, with some saying it looked more like Worzel Gummidge.” Worzel Gummidge is a talking scarecrow who appeared in a classic British kids’ TV show. According to Historic UK, well dressing is an ancient practice known only in the counties of Derbyshire and Staffordshire, involving the decoration of wells and springs with elaborate murals made of flowers and plants. It dates back to the Middle Ages and even further—probably some surviving pre-Christian practice to honor the all-important local water supply. If you are local, you can see the display for yourself until September 16. Honestly, it’s a pretty good photographic likeness for something made of flowers and what appears to be wheat.